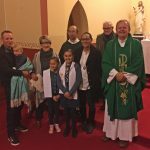 At St Mary’s Church, Bungendore, baptisms are usually held on the 2nd Sunday of the month at 10:00 am. Please speak to Deacon Chris or the office if this is not a suitable time for your family. You can phone the Bungendore Parish Office on 6238 1247 between 11am and 5pm on Wednesdays. The “Request for Baptism” form can also be downloaded completed and emailed to bungendore@cg.org.au. At St Mary’s, Baptism preparation takes place in an informal conversation with either Fr Peter or Deacon Chris. The parish asks that you participate in a preparation session, if this your first child or you have not previously participated in such a session for any other children. When you contact the office to organise a date for the baptism we will help you to arrange a suitable time for this preparation to happen. You will also be asked to attend a Presentation Mass. This is where you and your child will be welcomed to our Parish Community. If possible, the godparents are invited to attend this Mass to be part of this service. Currently our weekend Mass is at 5:30pm on Saturdays. From Sunday 7th January our weekend Mass will be at 8:30am on Sundays.